As recently stated in the “Photonics for the 21st century” European Strategic Research Aganda, European companies and research dominate every aspect of laser assisted manufacturing processes. Securing Europe’s leading position in this key industrial area requires well coordinated, focussed efforts of many players in various fields. The key to the growth of this market is understanding the interactions between lasers and matter and educating the manufacturing sector about the potential that laser-assisted processing can offer. The European Laser Institute ELI shall provide a strong platform bringing together the competence and knowledge on optical technologies. Promoting the technology transfer within Europe ELI aims to enhance the internationally leading position of European industry and research in the field of laser technology and photonics. In close collaboration with existing national and international organisations the ELI network, combining industry and research institutions, helps to influence R&D policy on a national and European level. 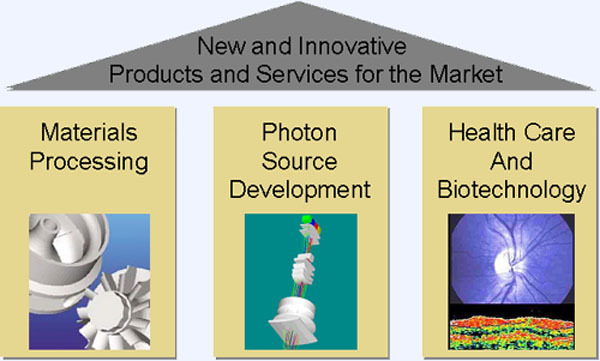 It is a major objective of the European Laser Institute to enhance the development of new products and services in the fields of "Materials Processing", "Photon Source Development" and "Health Care and Biotechnology". Estimating the offered jobs in the European Union within the past years it can be expected that the number could raise up to 1.5 million jobs in 2010. Though, the international competition is growing dramatically. Presently Europe is lacking a concerted effort to develop the fundamental sciences, technologies, components and systems that together drive all applications. Only a coordinated approach can make use of the economies of scale that are necessary to sustain economic production in Europe and to reach the critical mass of investments to address the big markets of the 21st century and raise the number of jobs as predicted. ELI aims to exploit existing resources and wants to maximise the efficiency of the existing networking actions on a regional, national and supranational level. ELI is also dedicated to SMEs interested in using and/or improving the use of laser for materials processing to establish new production processes.